Telagon Berlin 1:5 500mm on Canon 6D - is it possible? By all means don't give up on it. I am pretty sure the lens was made to fit a bunch of classic cameras. 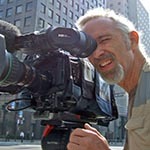 The first step is to see how far behind the lens you can form an image. Put the lens on a tripod facing out a window and aim it at a far off target. Focus the lens at infinity. Next hold a white piece of paper behind the lens at the mount end. Move the paper back and forth until you get a sharp image on the paper. The distance you measure from the flat part on the lens mount to the paper will be the thickness of the adapter you need. Hopefully this distance will be longer than the 44mm flange distance of your EOS camera. Once you have this figured out, it shouldn't be too tough to cobble together a simple adapter out of T-mount fittings and other odds and ends. Great idea, I should try it, thanks Paul! I can't help you with finding a machinist with a lathe, but cutting that part should be dead simple. You don'y even need to make a thread converter. All you need is that block, a plain single piece of aluminum with those dimensions, with a nice big hole in it. No thread, just a nice smooth flat on the camera side. If you can get one to make you a copy of that block(more or less, see below), then attaching a Canon EOS mount to it is easy. Look for a Canon EOS-M42 adapter. There are tons on ebay. You don't want it because of the M42, but because its got a Canon Male bayonet on it, on a substantial flange, and the thing has a nice big hole in it. Drill three or four holes for screws in the flange - your choice of size, 2mm is reasonable, countersink the screw holes, clamp it to the camera side of your new block, mark the screw holes on the block, and drill holes into that. Then tap the holes (using a normal screw tap) to match your screws. All this can be done with hand tools, a Dremel or a small electric drill. I have done this a couple of dozen times with the same kind of adapter, for Pentax. But Canon is very nearly the same. This is not a high-precision job at all. 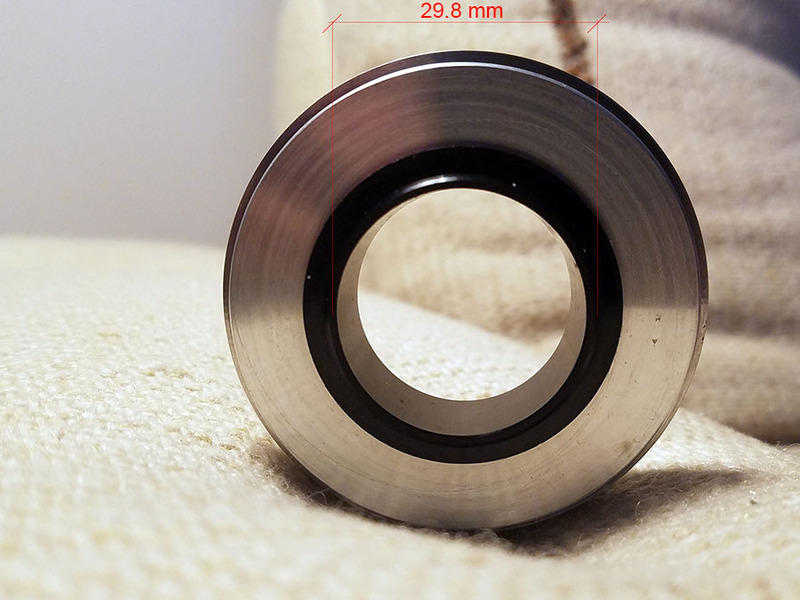 The only important thing about machining the block is that the bearing surface where it presses against the camera side of the removable mount, and the surface on the camera side be reasonably parallel. This should be no problem, with no special care taken, on any standard lathe. Now, the design of that block will have to take into account the camera-lens back focus. This needs to be established with some accuracy, to a millimeter or so for neatness. At a guess, looking at my block, you will need a considerably deeper one to take up the space behind the lens, allowing for the thickness of the flange on your Canon mount (that M42-Canon adapter I mention above). It is ok to make that block a bit too short than too long, which won't do at all, as what you want to keep is infinity focus. Its OK to overshoot infinity a bit, or even a lot. You will lose a very small amount of close focus, but that doesn't matter. Most of these lenses overshoot infinity anyway. They are made to be used at long distances, as they are a pain in the bottom at close range. If you want to perform a penance to atone for your sins you can try to take headshots of an ostrich at ten meters maybe, but there you go. I don't recommend it. These things do need their infinity focus though. Is the black inner part of this adapter an integral part of it or can it be unscrewed? If yes, this may leave you with a more useful thread to connect a camera to. 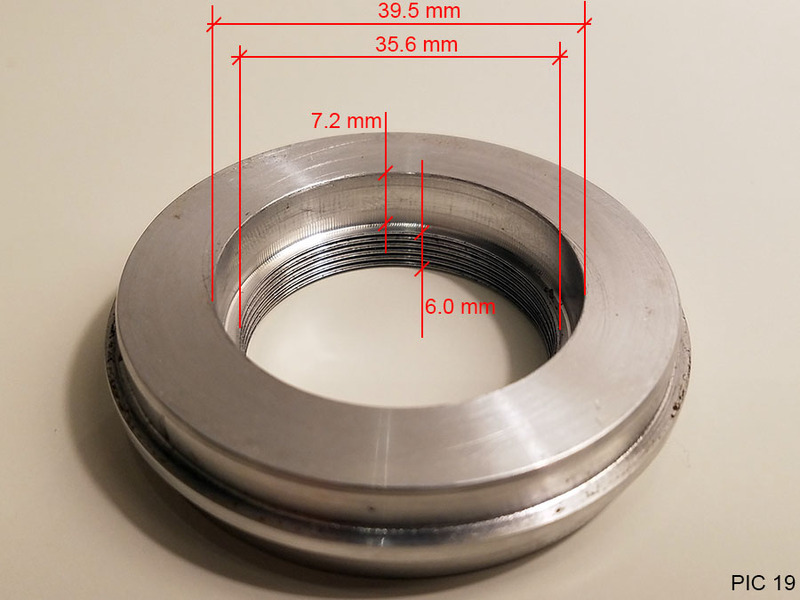 If not, then replacing this adapter with another ring with an outer diameter of around 63.7mm should be the easiest option, as it can be connected with the original threaded ring. Rummaging through my collection of adapter rings, my guess is that a 62mm to say 58mm step down filter adapter should do the trick. Mine has an outer diameter of 64.0mm, so it may just fit. This leaves you with a female 58mm filter thread and a cheap 58mm eos reverse ring would complete the set. Good idea! It was not easy but with some help of WD40, heavy duty vice and strong, big grip I did manage to unscrew the adapter and separate the two parts. Please see below the inner specs of the aluminum adapter. What is the plan now? Many thanks! The dimension of 35.6mm inner diameter corresponds with my M36*0.75 filter. So a step up ring from M36 to say M58 combined with a M58 Eos reverse ring may work. Two problems though - I don't know of any M36 step up rings and the 35.6mm inner diameter may be so narrow that it will cause vignetting with a full frame Canon camera. So using a ring that can be used instead of this aluminium adapter is probably still the best solution. This needs to be wider than 59.8mm with a maximum of 63.7mm. 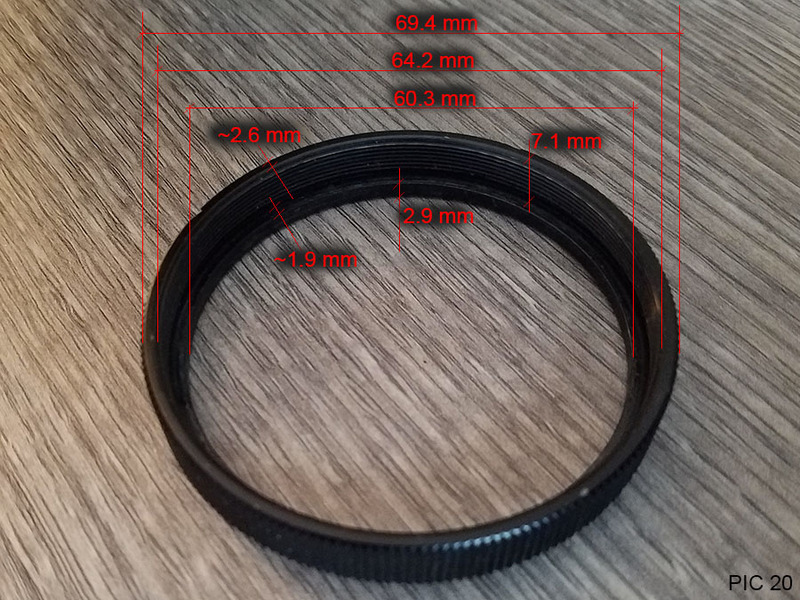 So for instance the combination of 62-58 step down ring plus 58mm reverse adapter as I mentioned, or a 62mm-60mm step up ring with a cheap chinese Eos extension ring (those have 60mm threads). I would suggest first looking at the rings you may already own. When looking at potential candidates, make sure there is enough room for the threaded clamping ring. A simple 62mm reverse ring will most likely not work as the clamping ring and the camera mount will jam into each other, you need a few mms extension. Alternatively you could get a ring to directly screw into the 64.8mm thread. This way you will not have the option to quickly switch between horizontal and vertical orientation though. Not sure whether the Click here to see on Ebay will fit exactly, maybe you need a M64 version. 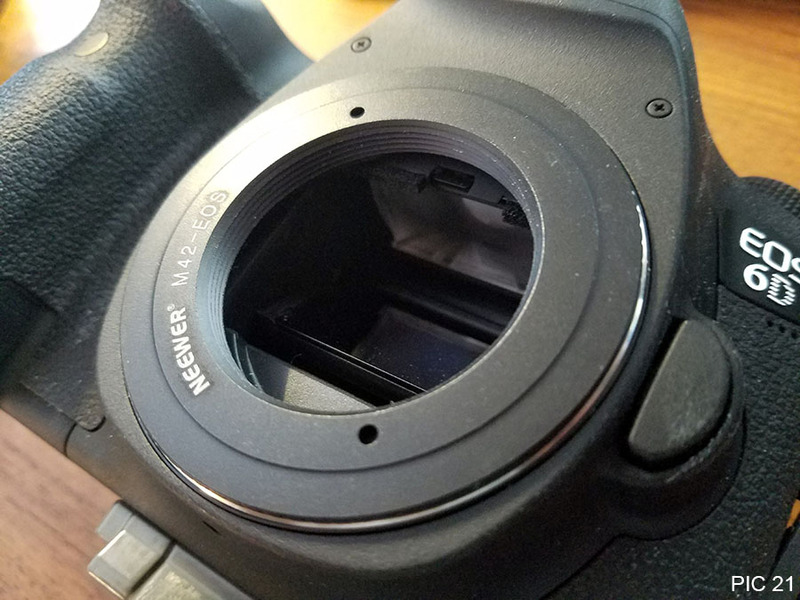 I agree, the step down ring which would be able to accommodate both the existing clamping ring (PIC 20) and the M58 to EOS reverse adapter as well, would be the most elegant solution. But as you rightfully mentioned, that adapter might collide with the clamping ring. fit in the clamping ring. BTW, the M42-EOS cannot be inserted into the clamping ring bit it's almost there - a bit of careful grinding on the adapter's circumference would make it fit. that aluminum part is substantial and attaching the M42-EOS adapter (which concidentally I happen to have) should be easy. I understand the two would have to be perfectly centered though. BTW, the inner diameter of the M42-EOS adapter is 41 mm. 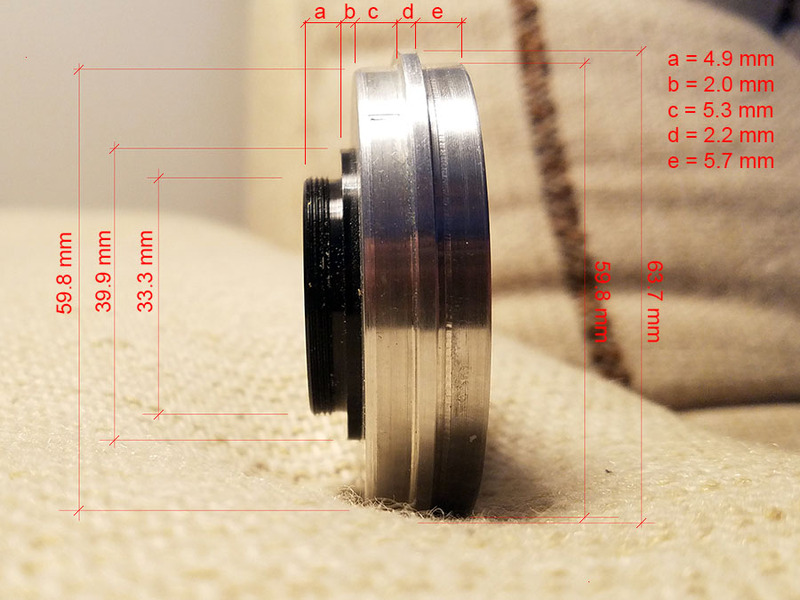 The inner diameter of the aluminum part is 39.5 mm on one side and 35.6 mm on the other (PIC 19) but this opening could be enlarged (at least to around 41 mm) to avoid/reduce vignetting. 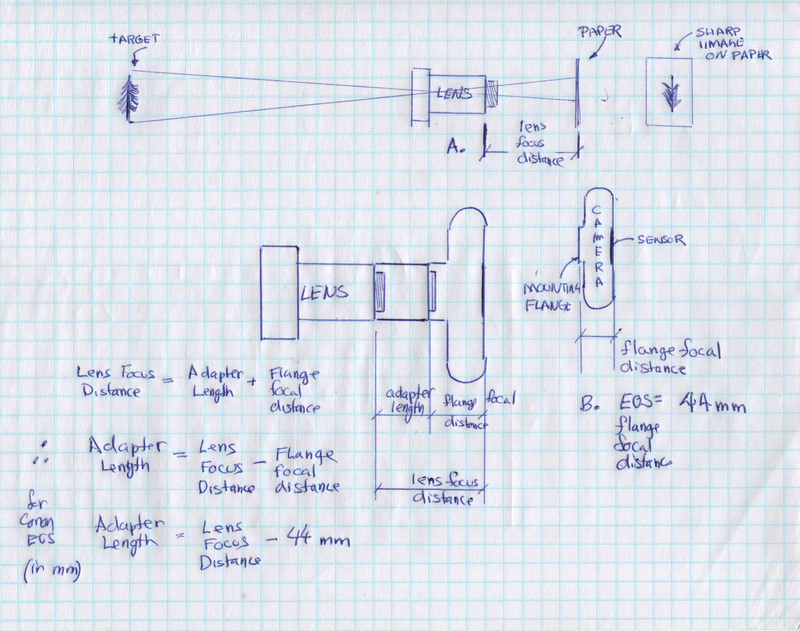 But again, establishing that camera-lens back focus distance, that Luisalegria and Paul, pointed out seems like the most urgent action item now before figuring out the final adapter setup. Just to confirm, is that image focus converge point supposed to be flash with the Canon 6D's front flange surface? BTW, I just ordered some reverse adapters, step up/down rings, and extension tubes to have sth to play with now and in the future. Accommodating manual focus lenses (some of which can be truly unique and amazing) is fun and contagious. If you are willing to sacrifice the existing adapter block, then you could of course use it. You would only be drilling some small holes in it anyway, so the damage would just be cosmetic. The mount doesn’t need to be perfectly centered. What you can achieve by eye is adequate. What it should be is parallel to your sensor. The block should already be parallel to the lens mount, so all you need do is be neat about the attachment of the m42 adapter to the block. The point of focus at infinity should be on your sensor. You can use Canon extension rings (normally for macro work, have male/female bayonets at either end) to take up extra length between the lens and camera. 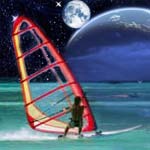 It’s an easy workaround but you will likely be left with considerable “beyond infinity”. But that’s not that important, see above. You are mixing up two of my comments here. A single reverse adapter will not work as it leaves no room for the threaded clamping ring, but a combination of reverse ring plus step down adapter or reverse ring plus step down plus step up (say 62-55 plus 55-58 plus 58 reverse ring) should leave you just enough room. Get in touch with Rafael at rafcamera.com, who can custom make adapters. You would need to give him the diameter and thread pitch. I don't know the flange distance on your lens. Determining that will be critical to correct focusing. If there is enough space you can get him to make you a ring to adapt to M42, get a focusing helicoid M42-M42, and then a M42 to Canon adapter ring. The thinnest M42 helicoid is generally 13mm closed completely. If you have one that is too thin and allows focusing past infinity that only limits your close focus distance slightly, but you don't want one too thick, which would not let you focus to infinity. Note added: as another poster pointed out, a 33mm end will definitely cause serious vignetting. There is a chance that even an M42 adapter will cause slight corner vignetting with such a long lens. Thanks for the clarification. I am currently awaiting the whole truckload of adapters, rings, tubes. Once I have them, I will be able to see what combination can work best. Rafael can make you a clamp of any length and diameter that will fit over the rear tube of the lens, hold to it with set screws and end in an M42 or M65 thread. You need to make sure about the flange distance. Glad to see you are working on this! Just to clarify, YES, the flange focal distance on the camera is measured from lens mounting flange surface to the sensor/film plane. Of course, without any adapters mounted. Step 1 Set up your lens on a tripod and point it out the window at target far away, as close to infinity as possible. Make sure the lens is focussed at infinity. Step 2 Hold a piece of white paper behind the lens and move backwards and forwards until you get a sharp image of your target on the paper. (it helps if you are in a darkened room when you do this. It also helps to have a friend measure the distance while you hold the paper.) 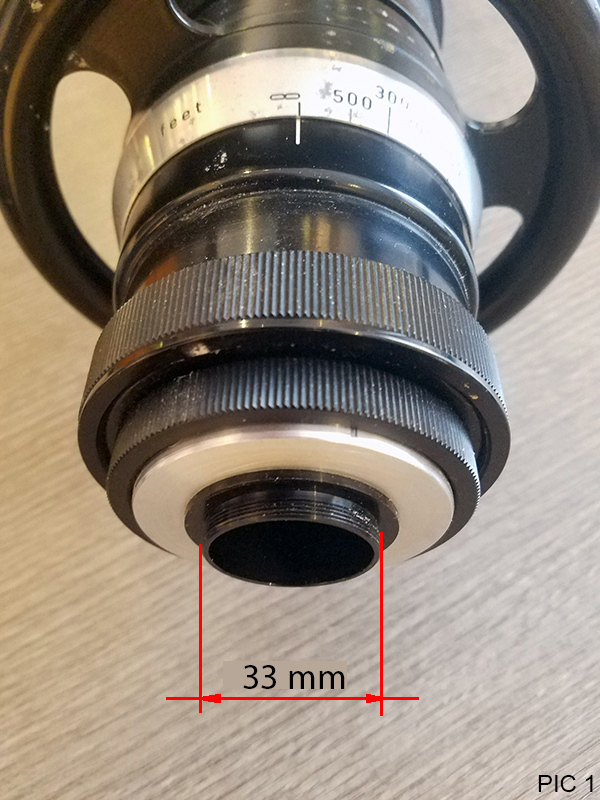 Measure the distance from the back of the lens mounting surface (not the end of the threads or bayonet, but the flat surface of the rear of the lens that fits flush against the mounting flange of the camera) This distance is the lens' focus distance. Step 4 Subtract the camera's flange focal distance (44mm for Canon EOS) from the lens' focus distance - The number you get is how long your adapter has to be in mm. Great, thank you kymarto. Let me get all the arsenal of stuff, that I have already ordered, and play with them first. Besides it's good to have those extra rings, tubes, adapters at hand anyway, so even if I only pick a couple of them for this project, I will have them for other future lenses. I am afraid that anything that is custom-made, will probably come at cost as well, but if all else fails, it's soothing to know people who can help with making those adapters. You could not have put it better. Many thanks for taking your time to explain and to make this great, self-explanatory diagram. BTW, did I mention, that I really appreciate each and every single reply that I have got so far on this, and all the enormous help that I have received from ALL OF YOU? So glad I found this site and this forum. You guys are awesome!!! I am not sure about the mount with the 32mm. It could be some kind of proprietary thread that was used to mate with standard mounts, ie. M42, Nikon, Exakta, etc. It could also be something that used to mount the lens to a motion picture camera. It's definitely not Russian Kiev - those were rangefinders with Contax/Nikon S bayonet mounts. They might have been thinking of Russian FED cameras, which had an Leica Thread Mount (LTM) of 39mm, but that would be larger than your 32mm mount. Another thought is that the thread mount is for a reflex housing, like the Visoflex. Finally, another thread mount I can think of, that is close to 32mm is the old Argus C33 "Brick" mount which was 33mm. Best of luck - it would be great to see some images from your lens - they are quite highly regarded. As well as the LTM thread, there was a Kiev 88 screw mount, it one of the 2-3 screw threads I've not got dimensions for yet. The Zenit 80 being another Russian one... Both the Kiev 88 & the Zenit 80 are multistart threads a quick check of the screw thread can probably rule them out quickly. Of the dozen more common ones I do have dimensions for none are near to 33mm diameter - Scneider's 26x0.5mm & the Opema M38 are the nearest!